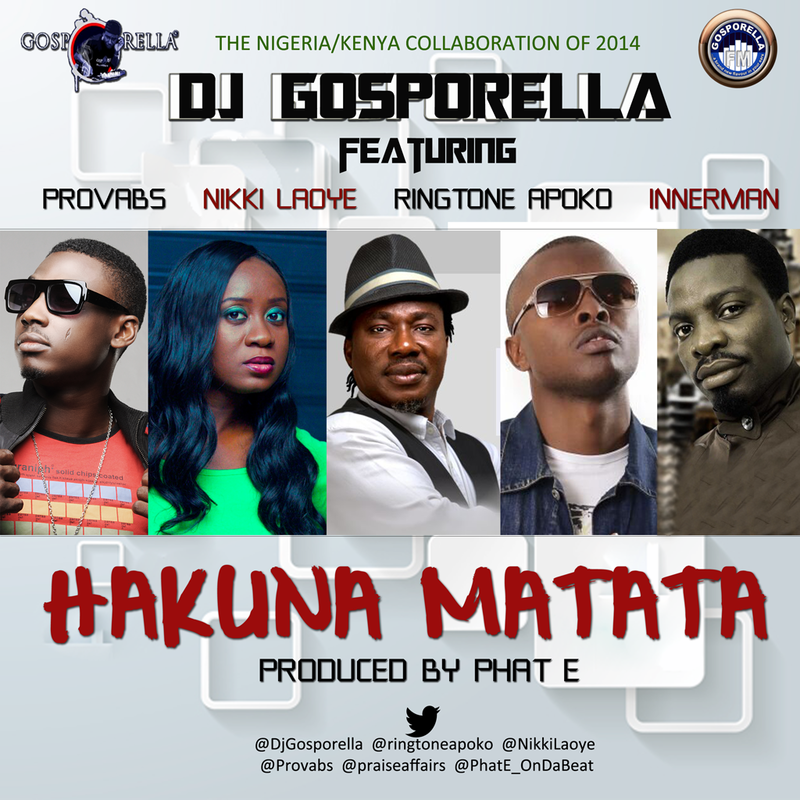 PRAIZHOUSE: NEW MUSIC:DJ GOSPORELLA - HAKUNA MATATA FEATURING RINGTONE APOKO, NIKKI LAOYE, PROVABS, INNERMAN. NEW MUSIC:DJ GOSPORELLA - HAKUNA MATATA FEATURING RINGTONE APOKO, NIKKI LAOYE, PROVABS, INNERMAN. And it's finally here. From Lagos to Kenya, it's the international hit single, "HAKUNA MATATA" by renowned DJ Gosporella featuring one of Kenya's top artistes, Ringtone Apoko and Nigeria's finest - Nikki Laoye, Provabs and InnerMan. Produced by top music producer, Phat E, Hakuna Matata's got only one message for you - "No Wahala, No Worries". With its rich blend of groovy drum patterns, nostalgic bass lines and the catchy chorus in Swahili & English, get ready to hit the dance floor from its opening bars and kick your worries to the curb. Speaking on the inspiration behind the song, DJ Gosporella shares "It was immediately after the 3rd edition of our annual Easter Sunday event, Gosporella Family Funfest. A whole lot of things had happened in the course of that event and Waoh! in reflection of how God pulled us through those trying times, I realised that there is actually no need to fret as God is true to His word. When God said "Be anxious for nothing 'cause I care for you", I experienced the full reality of it so I had a brain wave and called some of my friends who had featured in the Funfest including our Kenyan import for the event, Ringtone Apoko, who was still savouring the hospitality of our great country and the result is Hakuna Matata. We intend to shoot an international video in Kenya and Nigeria soon to promote the song"
Hakuna Matata is one of the tracks from DJ Gosporella's upcoming album (Rambling of a Rabbi) due for release next year. DJ Gosporella hosts “GOSPEL ZONE with DJ GOSPORELLA” every Sunday Morning on Beat99.9FM and recently,he launched his own online radio, Gosporella FM, to promote contemporary gospel music and further broadcast Nigeria to the world in a diverse and entertaining way. Download and enjoy "Hakuna Matata"